Von Stroheim have been described as some variation of a “doom band” and they fulfill that promise in a different, possibly unintended way by twisting around the meaning of that phrase. Von Stroheim do employ heavy, dark, and dramatic elements, but in a burgeoning, foreboding atmosphere. They’ve basically created a new album that’s a mesmerizing soundtrack for the doomed. The Big Takeover is pleased to host the premiere of the LP Love? Who Gets Love?, which is a biting treatise on love soured, where all of the femmes fatales are deadly, and as voiced by singer and theremin player Dominique Van Cappellen-Waldock, are set in stone amidst the dire world view displayed on the lyrics. The atmospheric sonics on the eight compositions are produced by the guitar and synth work of producer Raphaël Rastelli, with added violins by Franz Krostopovic (Pale in Grey) and guest appearances by vocalists Pete Simonelli from Enablers and Caroline Blanchet (ex-Choo Choo Shoe Shoot). The band’s name is a a nod to Austrian director Erich von Stroheim and the album artwork was done by David Crunelle. Love? Who Gets Love? is the sleeper release of 2019 and totally unlikely to let you sleep. 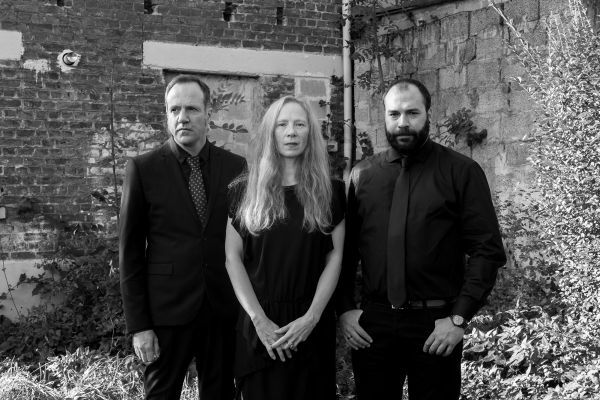 Von Stroheim was formed at the end of 2013 in Brussels, Belgium by Van Cappellen-Waldock (Baby Fire, Keiki…), guitarist Raphaël Rastelli (Keiki…), and drummer Christophe Van Cappellen. The band’s debut EP_ Sing for Blood_ was released on Navalorama Records in April 2015 in a limited edition of 150 hand-numbered copies in black craft with printed inserts. Van Cappellen left in December 2015 and was replaced by John Thys. In the spring of 2017, von Stroheim were artists in residence at La Maison des Musiques (Brussels) where they worked on a live soundtrack for Impatience, an avant-garde film by Belgian director Charles Dekeukeleire (1928). Thys left the band that summer, but kindly recorded six out of the eight tracks on Love? Who Gets Love?. A year later he was replaced by drummer Yannïck DaÏf, who recorded the remaining songs. Von Stroheim have been described a cinematic doom and compared to PJ Harvey singing with Black Sabbath, Neurosis featuring Jarboe, OM, and Hexvessel. They have opened for bands such as Enablers, Jucifer, OvO, Morkobot, Ronin, Le Singe Blanc, Martin Bisi, and many more acts.